When and How Often Should You Brush Your Teeth? The American Dental Association recommends brushing your teeth at least twice a day. Brushing your teeth helps remove food and plaque, which is a film that forms on your teeth and contains bacteria. When you eat something that contains sugar, the bacteria can release acids that attack tooth enamel. When this happens again and again it can break down tooth enamel and lead to cavities. Plaque that isn't removed also can harden into tartar. If you've eaten an acidic food or drink, avoid brushing your teeth for at least 30 minutes. These acids weaken tooth enamel, and brushing too soon can remove enamel. You can reduce the acid build up by clearing food and sugars with swishing with water immediately after eating. If you know you're going to eat or drink something acidic, brush your teeth beforehand. What Causes Sensitive Teeth, and How Can It? 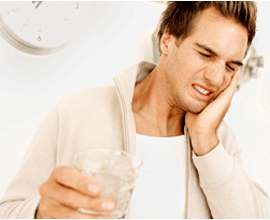 Sensitive teeth are usually the result of worn tooth enamel or exposed tooth roots. However, tooth discomfort is sometimes caused by a cavity, a cracked or chipped tooth, or a side effect of a dental procedure, such as bleaching. To prevent sensitive teeth from recurring, brush your teeth with a soft-bristled toothbrush and fluoride toothpaste. Floss daily. Avoid vigorous or harsh scrubbing, highly abrasive toothpaste, and excessive brushing and flossing. If you grind your teeth, ask Dr. Smith about a night guard. Tooth grinding can fracture teeth and cause sensitivity. You also want to limit acidic foods and drinks, such as carbonated drinks, citrus fruits, wine and yogurt, all of which can remove tooth enamel. After eating or drinking an acidic substance, drink and swish with water or a fluoride containing mouth rinse to balance the acid levels in your mouth. It also helps to avoid brushing your teeth immediately after eating or drinking acidic substances, since acid softens enamel and makes it more vulnerable to erosion during brushing. You can brush your teeth effectively with a manual toothbrush, but an electric toothbrush can be a great alternative to a manual toothbrush, especially if you have arthritis or other conditions that make it difficult to brush well. The bristle movement of an electric toothbrush might even help you remove more plaque from your teeth and improve your gum health. If you choose to invest in an electric toothbrush (we recommend Sonicare) make sure the toothbrush is comfortable to hold and easy to use. Sonic toothbrushes are a bit more expensive, but are much more effective. It is possible to use a manual toothbrush to clean as well as an electric toothbrush, but the Sonicare brand is the easiest and most effective brush on the market. Most people clean more thoroughly with a sonic brush. Whether you choose an electric toothbrush or a manual toothbrush, what's most important is daily brushing and flossing. Is It More Effective to Floss Teeth with a Water Pick or Standard Dental Floss? Standard dental floss is considered the most effective tool for cleaning the tight spaces between the teeth. You can also use dental floss to scrape up and down the sides of each tooth. Water picks don’t have enough power to remove the sticky part of the plaque that allows the bacteria to stick to the teeth. They are better than doing nothing to remove food stuck between the teeth, but you really need to scrape all the surfaces of the teeth with either a toothbrush, floss or proxybrush to effectively remove plaque that causes dental disease. If you have a problem with plain dental floss getting stuck between your teeth, try either the waxed or Teflon varieties. If you still catch floss, then you may have rough restorations that may need to be replaced. Floss holders can help people with arthritis clean teeth in the back of the mouth. How Can I Prevent Tooth Stains? Drinking water to cleanse your mouth after eating. Sipping through straws to carry drinks past your teeth. 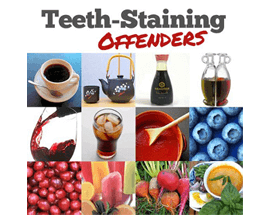 Minimize activities that can stain your teeth—smoking, red wine consumption, etc. Daily brushing and flossing to keep food accumulation to a minimum. See your dentist regularly for cleanings and check-ups. Dr. Smith can explain teeth whitening treatments/products or restorations that may be appropriate for your situation.